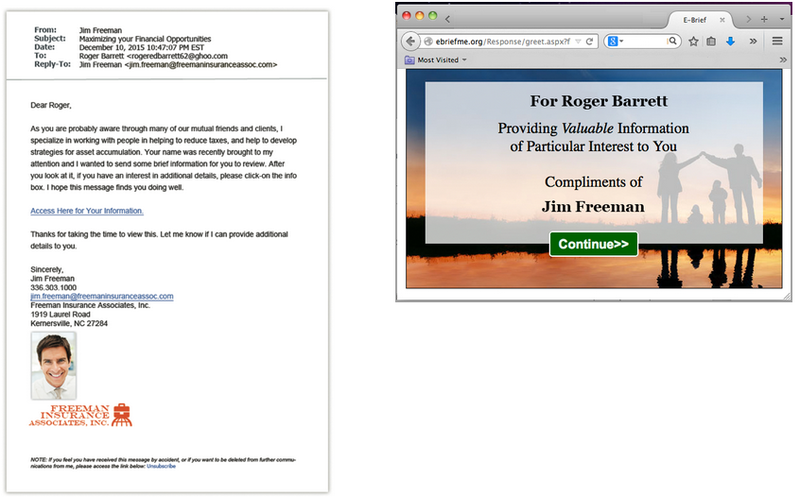 Emails sent from e-Relationship look like a personal email from you, not an advertisement. 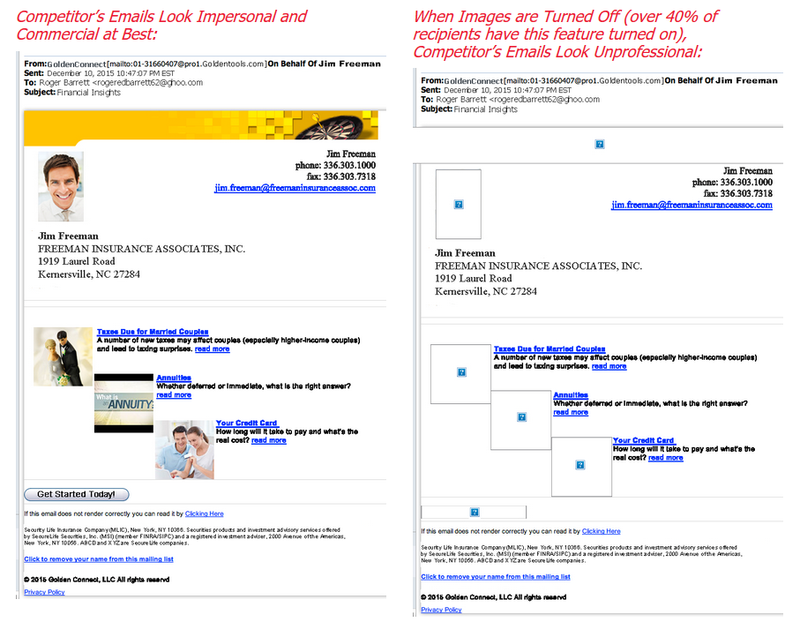 Competitors emails show “powered by…” to self brand their company, which only serves to confirm with the recipient that this is not a personal message. Variety = the spice of life! Our ‘Touch Points’ are a sprinkling of innovative, inviting messages! e-Relationship Content is written to trigger responses with a "call to action"! Our Response Generator Exceeds 20% yearly responses. Business Generation is our primary objective! These brilliantly designed ‘lead pullers’ are 54 TIMES MORE EFFECTIVE at generating responses for new business than traditional newsletters. Plus... you receive instant feedback! Likability generators show you care about more than the sale. They generate more than a 15% yearly response rate. People buy from people they like! Each card, message and photo creates appreciation for the advisor —building friendly rapport with clients and prospects. Validation generators educate recipients regarding what you do. Different than the competition, our e-Newsletters are professionally designed, written and programmed for better readability on mobile devices resulting in generating higher response rates than industry average. Although newsletters are not known to get high response rates, once coupled with our likability content and appointment generators, these validation pieces help to keep your expertise TOP OF MIND when recipients are ready to buy. Our Competitors’ poor results are due to several factors. • The HTML-only messages sent by most email marketers are usually blocked by ASP providers and end up in the recipient’s bulk folder. • If ‘Image-View’ is turned off, the prospect or client sees an unprofessional empty grey boxes displaying only a blue question mark. • Most show “powered by…” to self brand their company, which only serves to confirm with the recipient that this is not a personal message. e-Relationship is More Cost-Effective and Time-Effective. Add the cost of postage, printing and paper plus time and effort, and your cost per postal mailing is around $2. Not a tremendous expense…. UNTIL you consider your postal Response Rate of 0.5% and the need to send 200 mailings to generate just one lead — and your cost goes up to $400 per postal mail lead! e-Relationship generates a 2.43% Response Rate and brings in 36 leads when you send out 1500 emails — all for just $59.95 a month!